Is there a better comfort food than a great grilled cheese sandwich? Maybe. I think fried chicken and macaroni and cheese come pretty close. During a recent football party, I put together a grilled cheese menu and this one, the Jalapeño Popper Grilled Cheese Sandwich, was my favorite. This grilled cheese uses Cheddar, cream cheese, jalapeño strips (all the ingredients in a jalapeño popper) and bacon. Why hasn’t anyone thought to add bacon to jalapeño poppers? That’s a mystery. Anyway, this is super easy to make and quick. Unsalted butter is a necessity when grilling sandwiches. Preheat a panini press, griddle, grill or skillet. Spread cream cheese on one slice of bread. On another, place two slices of Cheddar cheese. Lay three or four jalapeño strips on the cream cheese side. Sprinkle bacon on top of cream cheese side. Place cheddar cheese side, cheese down on top of the cream cheese side. Brush melted butter on top of sandwich and place buttered side down on the panini press. Brush top side with melted butter. Shut panini press and grill four to five minutes or until Cheddar cheese is melted. Alternately, flip sandwich after two or three minutes if using a griddle, grill or skillet. Cut in half then serve. Use a panini press to make the perfect grilled cheese sandwich. You may think this Jalapeño Popper Grill Cheese Sandwich recipe is spicy, but to me, fresh jalapeños aren’t too spicy. Especially, when compared to pickled jalapeños. The peppers give the sandwich a nice crunch. Be sure to pick a nice bread that won’t fall apart. I used a jalapeño-Cheddar bread from my local Whole Foods and it was perfect. Try this sandwich next time you need some good ‘ol fashioned comfort food. Having never made scones before, I wasn’t sure how this recipe would turn out. Luckily, it worked. Thanks bacon! 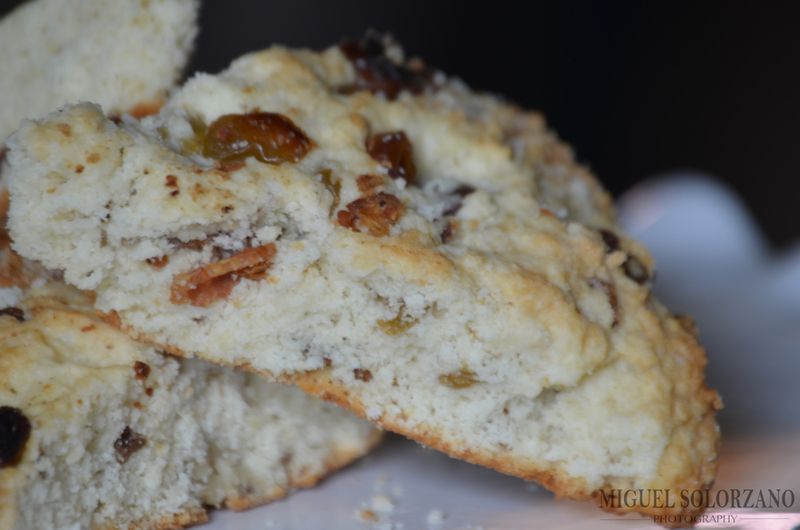 These Golden Raisin and Bacon Scones are a great sweet-savory treat around breakfast time. In a large bowl, mix together flour and sugar. Using a fork, cut in 6 tablespoons of butter until mixture looks like coarse crumbs. 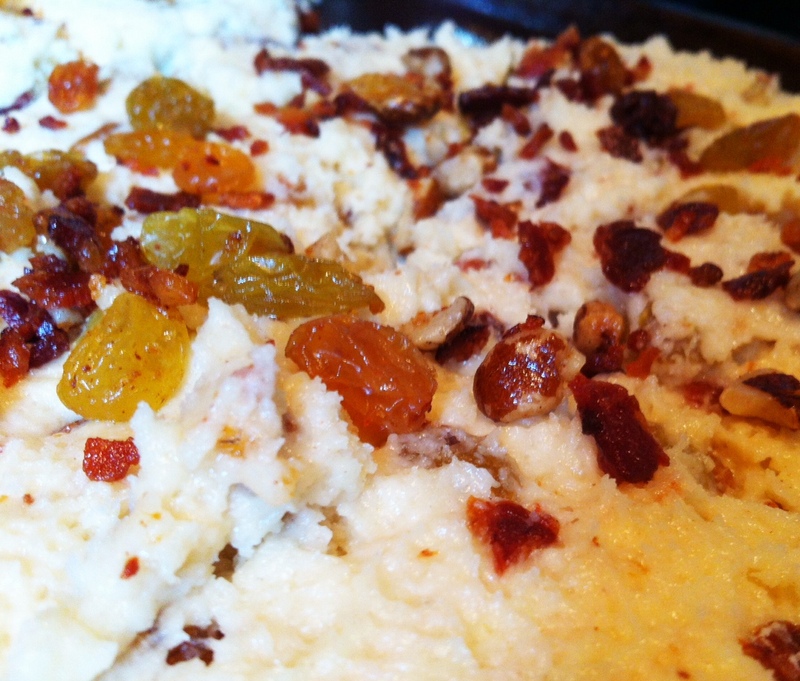 In a small bowl, combine bacon, golden raisins and walnuts. Stir 1 cup of bacon mixture into the flour mixture. Set remaining bacon mixture aside. In another small bowl, lightly whisk egg and cream together. Make a well in the flour mixture and pour in egg-cream mixture. Stir with a fork until the mixture is moist. Divide dough into two balls of the same size. On a greased cookie sheet, place dough balls about 3 inches apart and pat each one into an 8-inch round. Using a knife dipped in flour, cut each round into 8 pieces, but do not separate. Sprinkle remaining bacon mixture over each round then bake 14-16 minutes until edges are light golden brown. Carefully separate each round into 8 pieces. Serve warm with fresh jam. 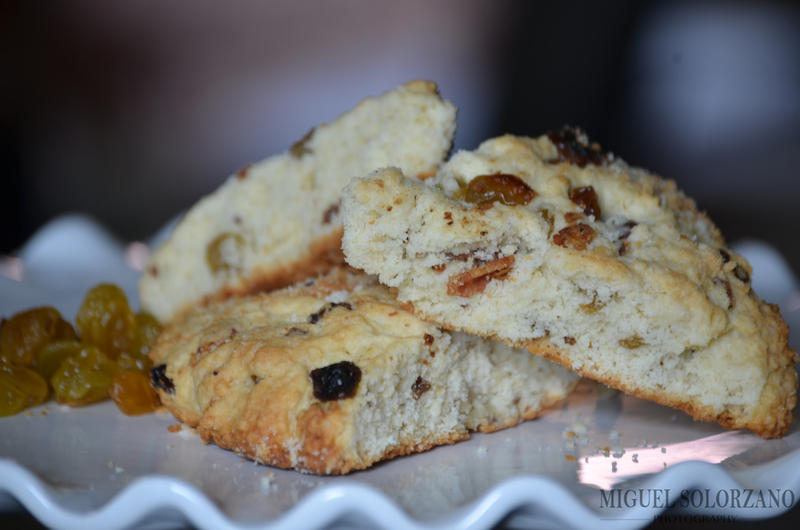 Scones make a great grab-and-go breakfast option if you don’t have time to prepare a full breakfast every morning. Scones are also very customizable. You can easily substitute in the ingredients of your choice when making this recipe. No picnic is complete without deviled eggs. 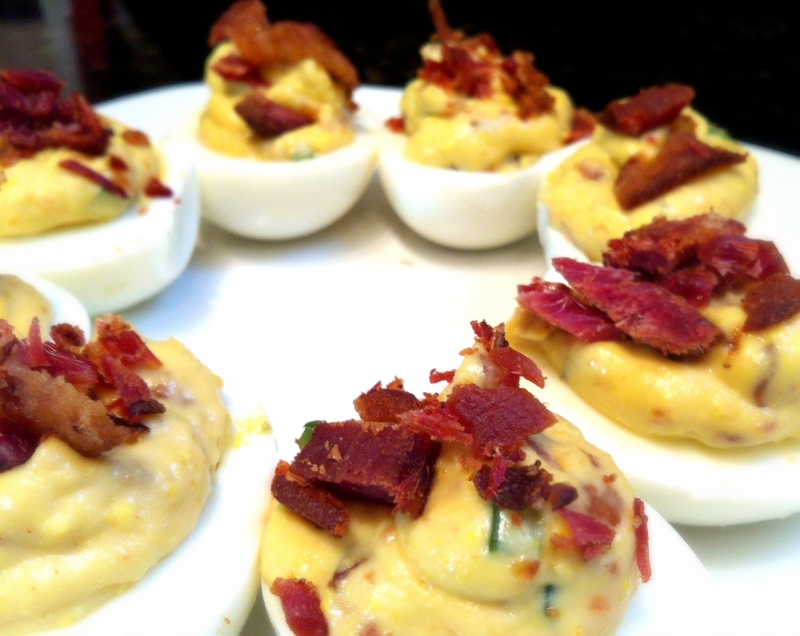 And what better way to take deviled eggs to another level than by adding bacon and jalapeño? 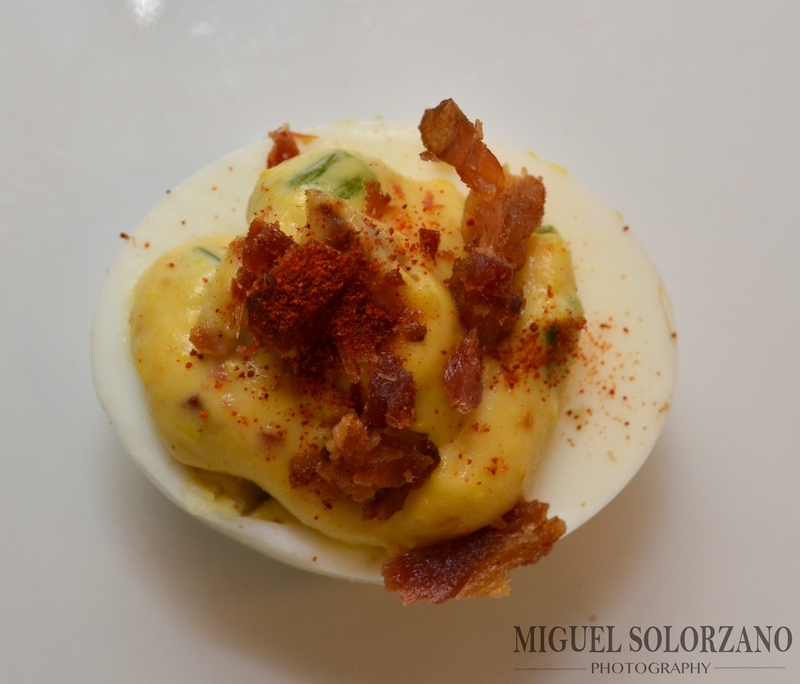 These Bacon-Jalapeño Deviled Eggs are sure to disappear very quickly so be prepared to whip up some more. Luckily, they’re very simple. Cut up bacon and place in a oven-safe pan. Bake bacon for roughly 20-25 minutes or until crispy throughout. Remove from oven and cool on a paper towel-lined plate. Once cooled, cut into small pieces. Remove the yolks from the hard-boiled eggs and place in a mixing bowl. To the yolks, add salt, garlic powder, chili powder, jalapeño and most of the bacon (save some bacon for later). Mash/mix all ingredients with large fork. 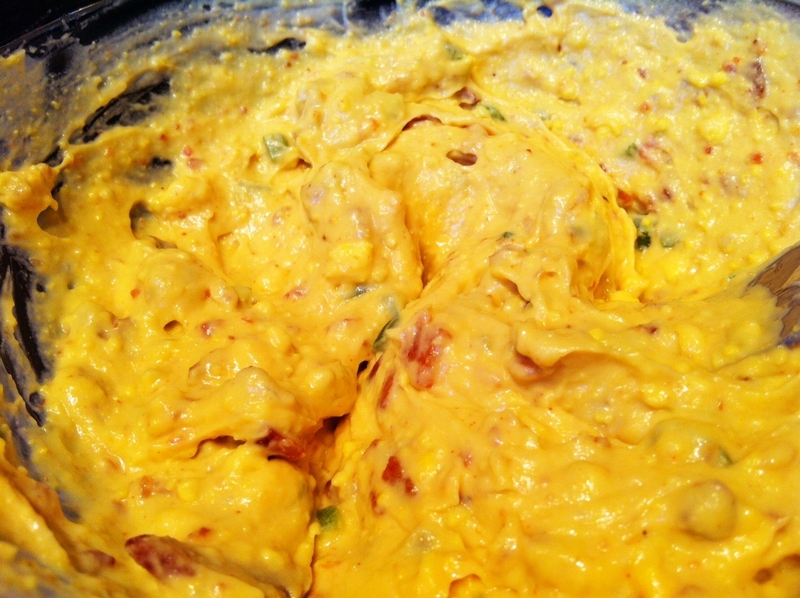 Gradually incorporate mayo until a fluffy mixture is formed. Taste and adjust seasoning if necessary. Using a pasty bag (or a Ziploc bag with a corner cut off), place yolk mixture into bag and squeeze into boiled egg white centers. Garnish with remaining bacon and dust with paprika. Once the bacon is cooked, preparing these deviled eggs takes no time at all. And you’ll get a lot of flavor for a little time. This is a dish you can take to any party. I guarantee they’ll be a hit. Biscuits from scratch can seem like a fairly daunting task. 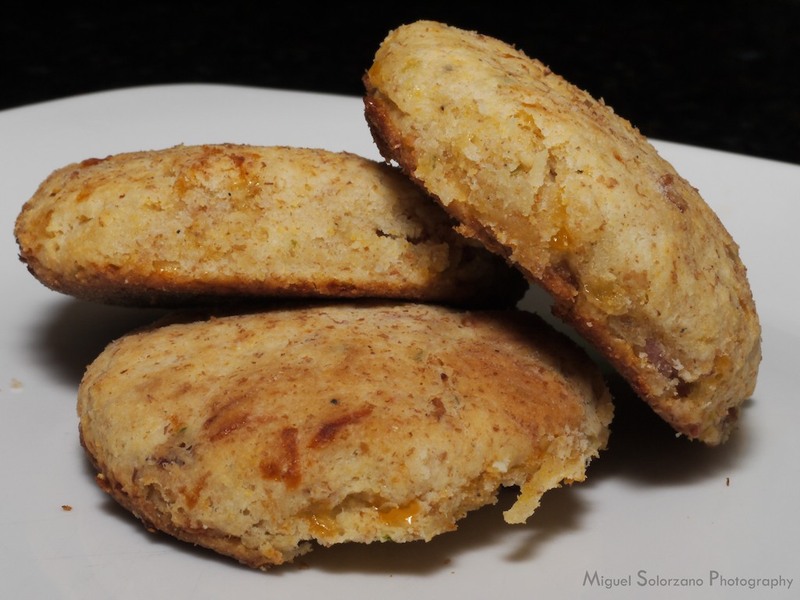 But don’t worry, this Bacon Cheddar Biscuit recipe is simple and you can go from step 1 to a finished batch in 45 minutes (cooking time included). Rather than making plain biscuits, I added some bacon and cheddar to make this extra tasty. Feel free to add more cheese or more bacon if you so desire. In a cast iron skillet, fry bacon until just crispy. Remove bacon with a slotted spoon and drain on a paper towel. 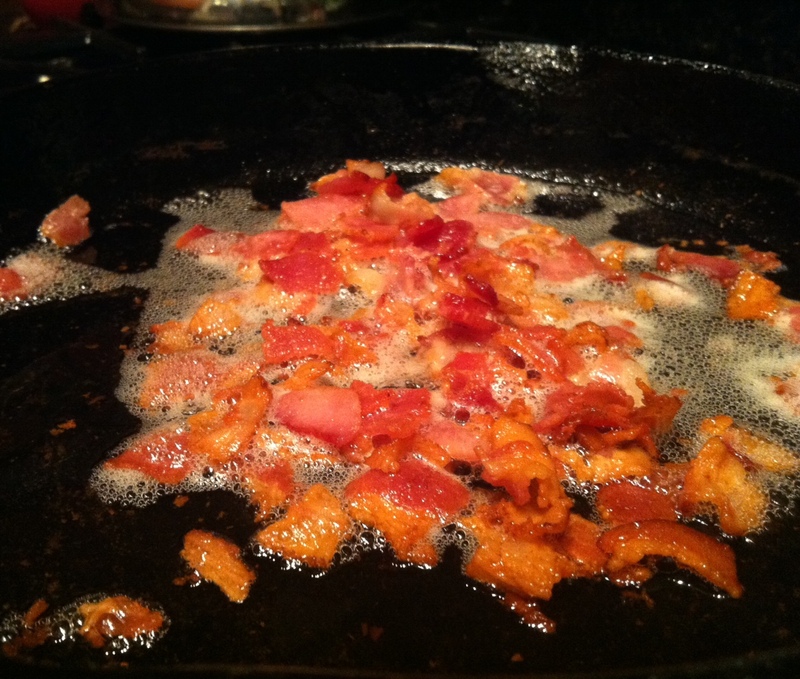 Discard or reserve all of bacon grease except for 1 tablespoon and set the skillet aside. Whisk all the dry ingredients in a medium bowl. Use a grater to shred butter and toss in with dry ingredients. Using a fork, cut the butter into the flour until pea-sized crumbs form. Stir in the bacon, cheese, chives and milk. Using a fork, mix until no dry flour remains. Sprinkle some flour on a clean counter and dump the dough on it. 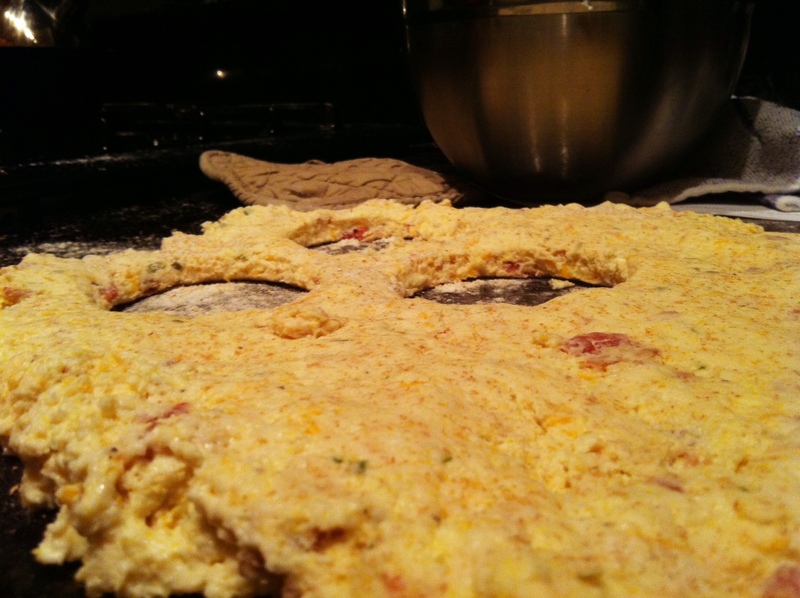 Sprinkle some more flour on top and using your hands, pat the dough into a circle about 1/2- to 1-inch thick. Use a biscuit cutter or other round item (such as a jar or glass) to cut out biscuit shapes. Transfer cut dough to the skillet. Reform remaining dough and cut more biscuits until no dough remains. Bake the biscuits for 18-20 minutes or until a toothpick inserted in the middle comes out clean. Let biscuits cool for 5 minutes, then serve. These biscuits go great with most meals. They’re especially an awesome way to make a breakfast biscuit sandwich. No matter how you consume them, you can store them in a sealed container for several days. If you have any left over, that is. 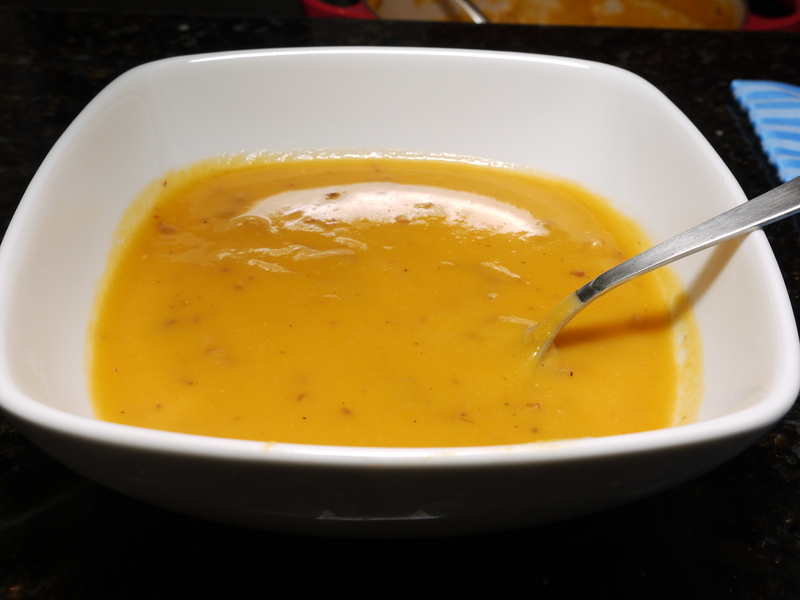 If you’ve seen some of my other recipes, you’ve probably figured out that I enjoy butternut squash. 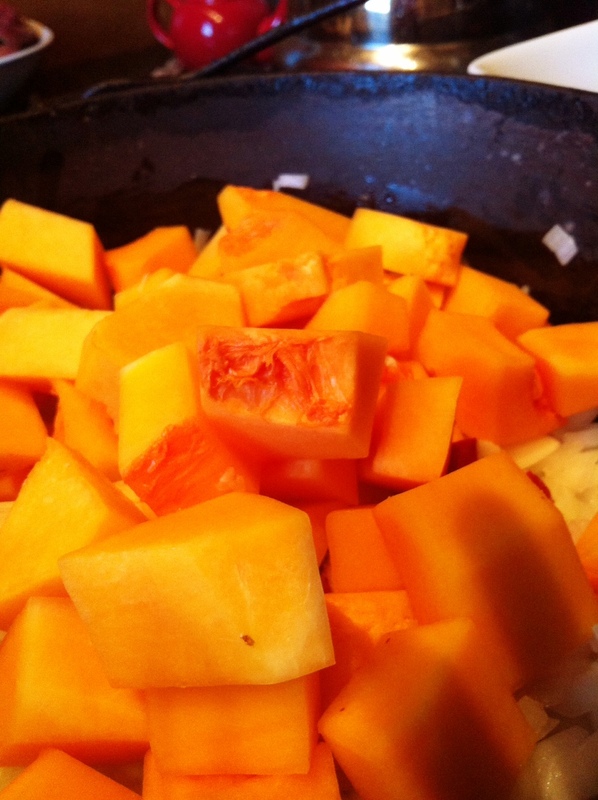 However, this is my favorite butternut squash recipe. This is a very hearty soup that I think it restaurant-quality. In fact, a friend recently told me it was the best soup he’s ever had. I’m actually somewhat reluctant to share this recipe at all, but everyone should experience this dish at some point. Melt butter in a large pot or Dutch oven over medium heat. Add chopped onions and saute for a few minutes, stirring occasionally, until soft and translucent. Add potatoes, butternut squash and chicken broth. Bring to a boil then reduce heat to low, cover and simmer for 30 to 45 minutes. While soup is simmering, bake bacon on a foil-lined baking sheet until crisp. Remove soup from heat. Puree the soup with a blender (immersion or standard) or food processor until smooth. Add the milk (or cream) and bacon, then stir. Return soup to heat and warm over medium, but do not boil rapidly. Salt and pepper to taste. Serve. I highly suggest baking the bacon. It will cook evenly and be crisp all around. 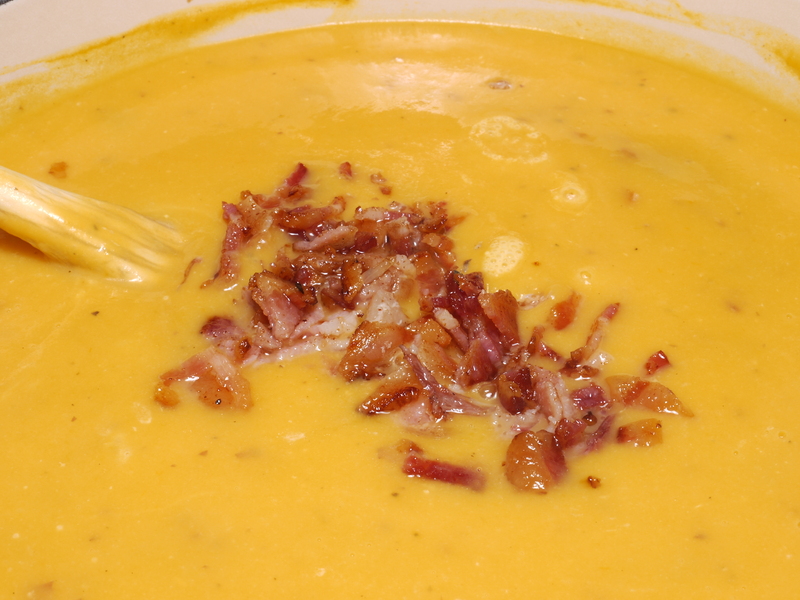 It’s no secret that bacon goes well with everything, but it goes really well with the butternut squash and potato base for this chowder. And I’m calling it a chowder because it’s thicker than most soups. Enjoy!